Two M4 tapped holes in the base of the prop adapter for running screws through the prop and spinner back plate to keep either from slipping (optional). The prop washer has holes in it for this that can also be used as a template. Note that the holes in the base where the spinner back plate rests are only 8mm deep, check to make sure you know the depth of screws you need and you may need to cut some length off of them. Forcing these screws will damage the motor if screws that are too long are used. Note: a good way to cut length off screws is to put a nut on and thread it all the way to the top of the screw and use a cut off wheel to remove what you need to. After the length is removed you can un thread the nut and this will repair the thread somewhat so you do not run in to issues installing it. Permanent X mount at the back of the motor has the same measurement holes as a DLE-50, 78mm measuring left to right and 66mm measuring from top to bottom hole, holes are 6.5mm wide so ¼ inch screws fit snug. 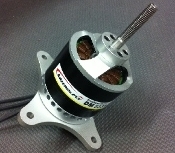 There are 3, 8x16x5 sealed bearings at the front of the motor and two 8x19x6 at the back. There is also one 45x58x7 concentric bearing at the back to handle high gyroscopic forces. This motor truly has a very robust bearing system. This motor is not meant to be disassembled in any way, for service work please send us an email and let us know what problem you are having.